As I've said about video editing programs - don't fuss over it. Use what fits you but start publishing already. Okay, so Nadine here is the deal…I don’t think you should invest in a background or a camera. Invest in a light. That’s actually the best thing to invest in if you are going to start making videos; a light, not a video. So lighting, as far as I am concerned, is most of the deal when it comes to making a good looking video. As you can see here, I have got…you know, not a very sophisticated background. What makes this look good is the lighting. I am using a lot of…just a kind of natural daylight, and I have got a couple of little small lights right here in front of me; very minimal lighting. What I recommend that you do is, do what I did when I got started making videos, and buy a soft box. Okay…go online and look up ‘soft boxes’, for…you know, a hundred dollars or so, you can get a decent soft box that makes really nice soft lighting, okay…and if you are going to just use a regular light, a way that you can get away with making a…you know, kind of a nice soft light, is to get a very high wattage light bulb…like get a hundred and fifty-watt light bulb, and then point it at a white ceiling, okay…that’s maybe a little bit in front of you, and that kind of makes the same effect as a soft box. What you want is, you want the light coming from…you know, not just one focus place; you want it coming from a more diffused place. They also sell this material called diffusion paper, which you can get a whole pack of it for…you know, ten or twenty dollars, and you can put that in front of lights as well, and that has a similar effect as a soft box, if you are using it with regular lighting, or if you are using it with LED lighting, which we sometimes do. 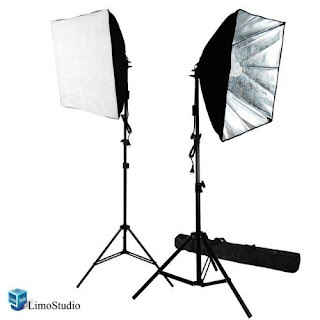 All this stuff, you can…you know, you can go to YouTube, look up some videos on ‘Basic Video Lighting’, and look up ‘Lighting With A Soft Box’. 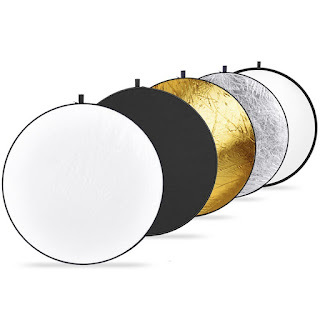 Another thing you will probably want to invest in, is a reflector…okay. Reflectors are these kind of circular things that are usually silver. Sometimes they are silver on one side and gold on the other, depending on if you want to get a little bit of a gold tint to it…also very cheap. And what you do there is, you take your soft box, and you kind of put it over on one side, and then you put your reflector on the other, and this reflector kind of fills in the light over here. And if you look at me right now, the way I am lit, I am brighter on this side; I am more lit over here, and I am a little bit less lit over here. There is a little more of a kind of a shadow to this side, because there is windows over here, and this is what’s lighting me.And that creates…you know, kind what they call character lighting. So you want to light yourself a little bit more on one side than the other. My experience is that, if you have a good light…okay, again…something that you can buy for a hundred dollars, and a reflector, and you set that up, that’s going to make almost any video you shoot…I mean even a video you shoot with your…you know, your phone or your mobile device, or a little hand held camera, that’s going to make your video look really great. Now next, if you decided to go big and actually get a camera to shoot video, get one that has a lens that’s at least eighty-five millimeters, okay. So I have got a lens that’s an eighty-five millimeter lens that I like to use; the one that we are using right now to shoot this video is a hundred and thirty-five millimeters. Anywhere in that range from about eighty-five to a hundred and thirty-five millimeters. That makes the shot where…you know, the camera kind of has to be far away. Our camera is probably about fifteen feet away from me right now with that longer lens, but what that does is, it makes all your proportions look normal. You notice if you use your webcam on your computer, or if you use your mobile for your camera, the video can look great, and we sometimes use these things to make our videos, but it kind of…it distorts your face a little bit. It makes everything look a little unnatural and wide. Not that big of a deal, but if you are going to take that next step, get yourself a camera that has a little longer lens. 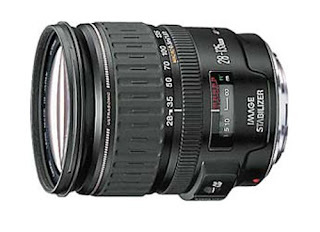 You might have to do a little research here as well, because if you buy one of the more modern cameras that has a smaller sensor on it,it actually makes the lens a different focal length, so just make sure and do a little research, and make sure that the camera and the lens…you know, when you put them together, they make that focal length between eighty-five millimeters and a hundred and thirty-five millimeters. And I think if you do those two things, I think you can get some really great video. I mean, most of my videos that I shoot, are shot on cameras and lenses that are several years old, right…but with good lighting. Again this is mostly natural light here, with a couple of small lights; you know, we use those in case it starts getting darker, or just to fill in a little bit, but you can get some great effects as long as you have great lighting. So start by investing in good light.